MarketingSherpa Email Summit 2012 kicked off Wednesday, February 8 with Sergio Balegno, Director of Research, MECLABS, and Dr. Flint McGlaughlin, CEO and Managing Director, MECLABS, the parent company of MarketingExperiments. Sergio emphasized this is a research-based event driven by the 2012 Email Marketing Benchmark Report, featuring W. Jeffrey Rice, Senior Research Analyst, as the lead author. This book is our ninth annual benchmark study. The benchmark report includes research and insights from 2,735 marketers, and identifies barriers to email marketing success and what marketers are doing to overcome them. As you can see, email marketers are facing a wide variety of issues at fairly high percentages. Everything from data systems integration to email efficiency comes in at 40%, or higher. 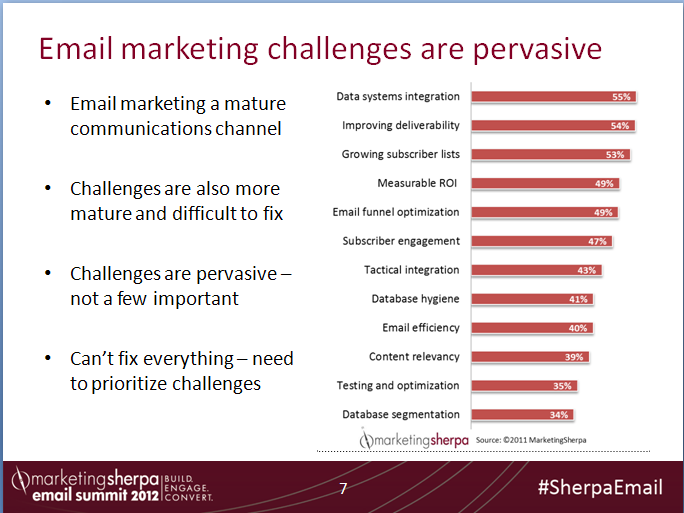 “Challenges to email marketing success are pervasive and growing,” said Sergio. Flint immediately gave the audience empirical evidence that there are no expert marketers, only experienced testers. He added several slides to his presentation deck showing the result of a recent MarketingExperiments test on a Web clinic email subject line. Paul Cheney, Junior Editorial Analyst , MECLABS, came up with a Web clinic title based on a style that has worked well in the past, and Flint challenged the model by writing a title that reflected a hypothesis he wanted to test with the audience. My clinic headline beat Flint’s by 92.2%. Significant. Here’s another test on email message calls-to-action based on a campaign conducted by a previous Email Summit attendee. “There’s a difference in the thought sequence,” says Flint.